I am not a big fan of horror films. In fact, I am really, really scared of them. I once watched the film “Shelter” (starring Julianne Moore and Jonathan Rhys Meyers) with my Mom and life was never quite the same after. Or watching any film starring either Julianne Moore or Jonathan Rhys Meyers, for that matter. I could not sleep for at least two nights after watching “Shelter” and I swore I would never, ever watch another horror film again. That was until I watched the trailer for Guillermo Del Toro’s new film “Crimson Peak”. The entire time I was watching it, I had my finger on the escape button, so that I could click the video away any time it got too scary. But I did not. In fact, I fell in love with Mia Wasikowska and Tom Hiddleston, the lavish costumes and the promise of some good old-fashioned gothic romance. One of the most impressing aspects of “Crimson Peak”, is the mansion that belongs to the Sharps. It is the ultimate haunted house, with squeaking doors and stairs, wallpaper that peels off the walls, a gasping hole in the roof where leaves and later snow falls through and, last but not least, ghosts wandering around the dark halls. Upon first seeing the mansion rising out above the crimson red clay, you feel like Edith does in the film: both terrified and intrigued. Despite the utter creepiness, Allerdale Hall is fascinatingly beautiful. Director Guillermo Del Toro had the entire house build on set and as a viewer, you feel the vastness and the reality of the house, which makes it even more frightening. 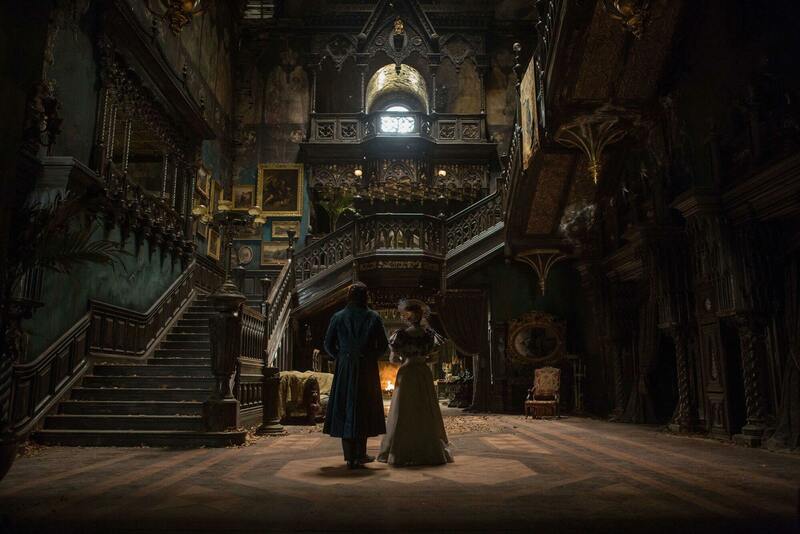 The attention that is paid to the look of the house is put into every other visual aspect of “Crimson Peak”. The costumes are lavish and colorful and rich and detailed; the perfect fit for a Gothic costume drama. Edith, as innocent and curious-minded as she is, is dressed in rich and glossy ochre and white, ghost-like night gowns at night. This while Thomas and Lucille wear strictly black, with the exception of Lucille wearing a crimson-red ball gown during a party in Edith’s home town. The costume design leans towards over-the-top, but somehow, it fits perfectly and adds to incredible attention to detail. “Crimson Peak” is a visual fest, splendor as far as the eye can see, but it would be nothing without the stellar cast director Del Toro has assembled. Mia Wasikowska looks like a perfect Edith, with her pale, porcelain skin, soft brown eyes and blond waves draping down her face and twirling around in the winter air. As a viewer, you identify with Edith so much, as she falls, against her own better judgement, in love with the dashing Sir Thomas Sharpe – as he is very convincingly portrayed by Tom Hiddleston. Together, they shine like the burning candles featured in the film. Surprisingly enough, Wasikowska and Hiddleston were not Del Toro’s first choice. Initially, Emma Stone was cast as Edith and fellow Brit Benedict Cumberbatch as Thomas. Although it would have been very interesting to see these two actors together, Wasikowska and Hiddleston turned out to be the perfect choice for the characters. Hiddleston plays the part of baronet Thomas Sharpe beautifully, tricking the audience as he tries to win Edith’s heart for her money and over the course of the film, developing feelings for her. In his eyes, you can see the character’s struggle, whether what he feels for Edith is real or not. In the end, the audience is still not sure and that is okay, because you have felt his struggle. But the most intense acting goes to Jessica Chastain, the normally gorgeous redhead, who is now transformed into a bitter, raven-haired ghost of a woman. Always lurking in the shadows, Chastain portrays Lucille, Thomas’ sister. She is the calculated sibling, carrying the sharpest chip on her shoulder. Always speaking in cryptical sayings, Lucille is perhaps the scariest aspect of “Crimson Peak”. It is her Edith should be afraid of, instead of the ghosts wandering the house at night. Chastain portrays the role with so much precision and focus, which leads to a very intense and perfectly on point performance. How much attention Del Toro and his team paid to the countless details in the swoon worthy visuals, how little has been paid to the plot of the film. “Crimson Peak”, despite the glorious acting and delicious plot twists, is incredibly predictable. From the moment Thomas and Lucille Sharp enter Edith’s life, you know something is wrong with them. They are beautiful, mysterious and British bad guys. They do bad things, and Edith should stay away from them and their very obvious trap. The “reveal” at the near end of the film does not feel as climactic and resolving as it could have been, because the audience could have seen it coming from miles away. Both Hiddleston and Chastain poured their heart and soul into the characters of Thomas and Lucille, but due to poor writing, they were disappointingly see-through. 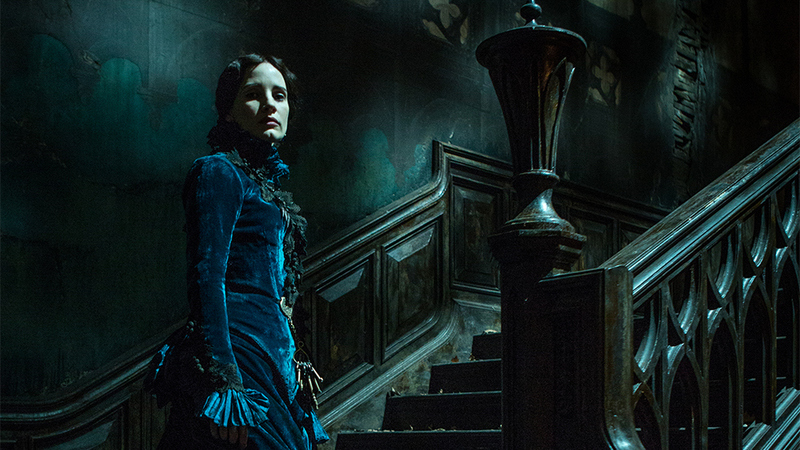 “Crimson Peak” is in theaters right now and even if you do not like horror films, this one is a must-see. The film will haunt you, not for the ghosts and the horror, but for the beautiful details and the glorious acting.